I am 16 again with itty bitty pink shorts, bare feet, and my purple tank top with little hearts and butterflies. I have recently declared myself to be a vegetarian. It doesn’t matter, she tells me, beans are vegetarian- even though she made it with a ham bone and there are lots of pieces of ham in it. I still eat it because she is my Nanny, and she would have her feelings hurt otherwise. She smiles at me, and her sparkling blue eyes set me in a trance. I hug her and tell her I love her. Then I wake up feeling a kiss on my cheek and smelling her lingering perfume. 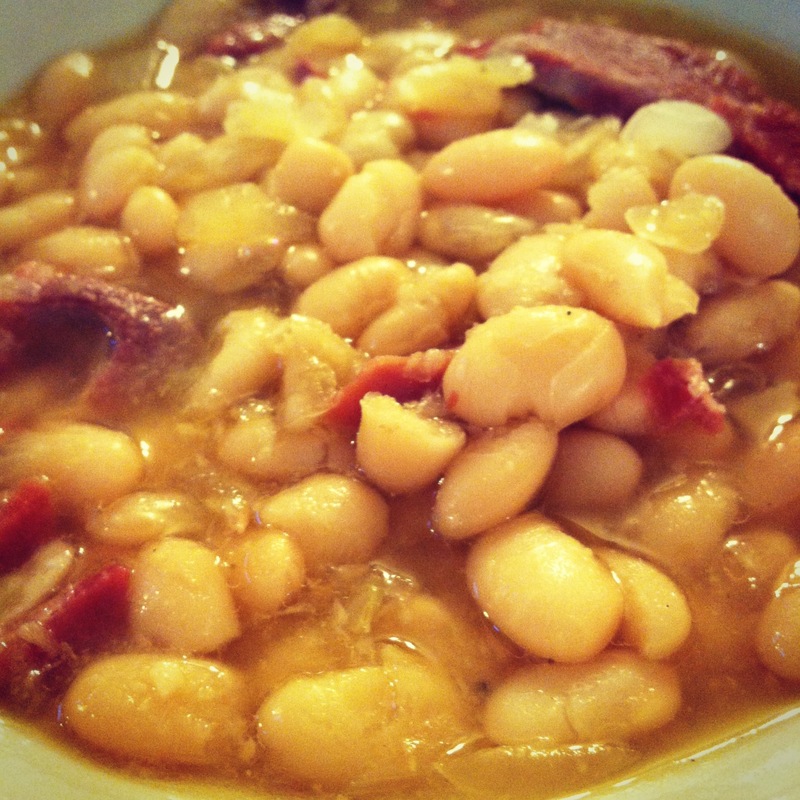 Recently I have had this recurring dream when my Nanny makes this amazing white bean soup with ham. I had to try to make it in her honor. I do not have a recipe, but I tried to make it the way I think it should taste. I had almost forgotten this meal, because I have not eaten this in a VERY long time. Thanks to my dream, it is not going to be lost every again. Next time, I am going to make my Nanny’s Porcupine Meatballs- meatballs made with a different meats and rice. Delish! 1. 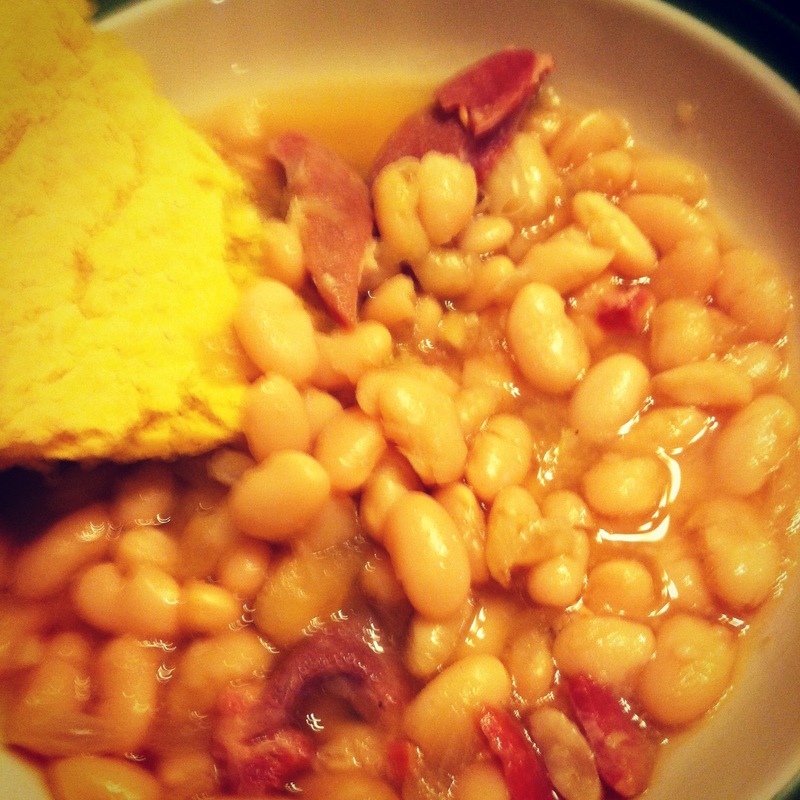 Soak your beans overnight and rinse before cooking. 2. Using a nice size pan- I used my sturdy dutch oven- Cook your onion and garlic for about 10 minutes or so on med. heat. 3. Add your beans and mix together with the onion and garlic. 4. Add your chicken stock and Worcestershire sauce. This should cover your beans. If not, add some water. 5. Add your ham hock/bone. If you are adding cooked ham, wait 1 hour or so before adding it. 6. Pepper to taste. I didn’t add salt. Between the ham hock and chicken broth, I didn’t find that it needed any. I would wait to the end to add salt, if you choose to do so. 7. Cook at least 2-3 hours. I served mine with cornbread and a mixed salad. I will have many great dreams about this meal!